A nice discussion I made for a student paper, which included conducting an experiment involving Amnesia: The Dark Descent and Britney Spears’ Hit Me Baby One More Time. Sound seems to be one of those elements given to video games of all genres, which is unjustified in its attention and praise given by players and critics alike. We as players tend to value the level of graphical quality, complexity of puzzles, designing of gameplay, and depth of story before we turn to sound and music. However, should music be implemented wrong, or not at all, we are the first to feel put off or judge at how ‘unbalanced’ the game feels. I must admit I am criminal of this exact act, however I have chosen to dismiss my ever-loving attention to everything visual for a few moments to give grace to game sound. And in doing so, I’ve looked deeply into one genre of games that arguably almost completely relies on sound; horror games. Just as in film, survivors and horrors in games tend to manipulate the player’s emotions through audio cues, most notably the Dead Space series (EA Games/Visceral Games) and the Silent Hill series (Konami/various developers). More or less, a developer can place a good bet that if a player stands in a seemingly innocent-looking room, with some high level eerie music or abnormal sound effects, the player will still feel quite panic-stricken and on high alert of imminent danger. Certainly, games have seen to sway more towards twisting the normal to create fear rather than trying to create supernatural sound effects from scratch. Humans are known to have a severe problem with something that looks simply wrong against their familiarity of nature (take Silent Hill, for instance), and this rings true also with audio. Any sounds such as creaks, gritting of teeth, footsteps that belong to no host, and whispers in the air all appear quite foreboding. Place this against a decent low-pitched set of violin and piano chords and you have a recipe for fear! When conducting such an analysis, one cannot ignore the critically acclaimed Amnesia: The Dark Decent. The thing that is so interesting about this game is that while other games seek to traditionally confront their players with their monsters and enemies head-on, Amnesia does not. Because players cannot call upon weapons to defend themselves, the game essentially has no real enemies (in the traditional sense) and no fighting, but uses exploration at the highest level. The players know that monsters exist in the game, but so long as they strategically keep their sanity down they will never have to face them. The use of sounds and audio cues to signal to the player how the protagonist is coping with his sanity replaces traditional enemies and fighting. The more vulnerable the player becomes to the appearance of these out-of-sight monsters, the more palpable such sounds become, many of which include the examples mentioned earlier. The gritting of the player’s teeth is indeed the most obvious one for many, and also is the most critical to gameplay feedback. The pure disgust it emits whilst playing the game strikes greater fear than any fictional roar of a monster ever could. Referring to Karen Collins’ research in An Introduction to the Participatory and Non-Linear Aspects of Video Games Audio, we can clearly observe the ways in which Amnesia almost bluntly takes note of music theory in games. The underlying soundtrack (i.e. ‘adaptive non-diegetic’) that is played throughout the levels set the scene and mood, and by consequence, manipulate the player’s emotions and how they react towards their situation. It is the ‘interactive diegetic’ sound, however, that seems to be the gold nugget in this game. The entire story, mechanics, even character design are built around the sounds of footsteps, breathing, and gritting of teeth as mentioned before. Another exceptional example is the well-placed voice-over cutscenes in which conversations between Daniel and Alexander are played at certain intervals, or cued ‘flashback audios’ of screams and torture which are usually followed up by a severe lash to the player’s sanity. 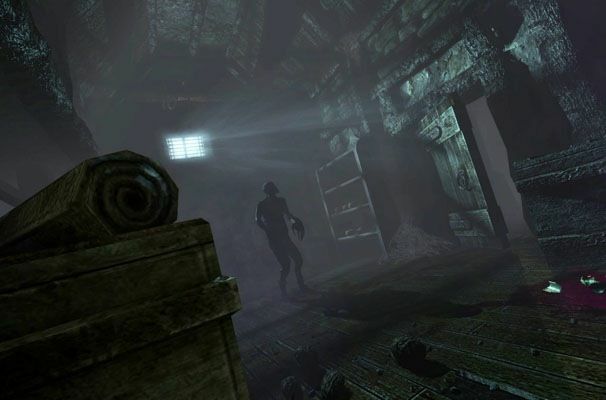 Amnesia’s use of sound not only provides direct gameplay feedback to the player, but also drives the story, the horror, and the gameplay itself. Thus, one could say that it isn’t the monsters that are the true enemy of Amnesia, but the actual sound. While Raymond’s study confirms the reactions a player emits in response to game sound, I was still interested in how game sound can react upon gameplay. Can a player become a better performer in a horror game based purely on sound? A lesser performer? To test this, I devised my own little experiment. My sister and I discussed the elements of sound in Amnesia that frightens us the most, and agreed that the sound in the game encourages us to feel ‘held back’ as if ‘time moves slower’. Furthermore, we also agreed that the music and sounds in the game influences us to act quickly, and therefore irrationally, making decisions without thinking them through. Therefore, we were more prone to fail, and lose sanity quickly, easily vulnerable to its monsters. So, we played through Amnesia for 4 minutes with normal sound on high, and recorded our facial expressions on webcam. Then, we repeated the same process, but placed the in-game audio on mute whilst playing Britney Spears’ ‘Hit Me Baby One More Time’ on high. An amusing experiment at most, but the results were outstanding. We discovered that with the normal music running we; found only 1 tinderbox (a crucial collectable in the game which helps to keep the player’s sanity down through light), responded to blurry visions quite poorly and with delayed timing, unable to light any candles quickly, and was caught by a monster once. The webcam showed many freaked facial expressions, shouts, angry and panicked demands to each other, and squeals. In contrast, the Britney Spears music led us to: find 3 tinderboxes, 1 oil jar (used for the lamp) and 1 health jar, light candles with ease and speed, respond to blurry visions efficiently, and never be caught by a monster at all. The game seemed a breeze and the webcam showed us laughing and smiling the whole time! It was certainly a way to decrease the fear and thus be able to make better decisions with a straight mind, however many would argue that overtime such a game could not be completed without relying on those sound cues to progress. In essence, sound seems to be given a second chance at praise with games like Amnesia: The Dark Decent almost stubbornly proving that whole game mechanics can be devised around the importance of audio. The fact that Amnesia is regarded as one of the scariest games of all time is notable, and it has sound to thank for. There is so much to be said about what sound can do to enlighten new and unexplored territories in the innovation of games and their mechanics, and may assist developers in finding new ways to venture into the player’s psyche. Collins, Karen 2009. “An Introduction to Procedural Audio in Video Games” Contemporary Music Review, Special Issue on Algorithmic Generative Audio. Vol 28/1 pp 5-15.